Militia general. He led expedition against the Cherokee, 1776. Colonial & state official. Lived nearby on Grant's Creek. 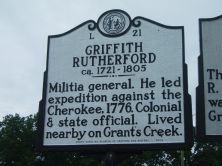 General Griffith Rutherford was a land speculator, militia general, and politician in North Carolina in the second half of the eighteenth century. Early in the Revolutionary War, Rutherford led his militia in attacks on the Cherokee along the western frontier of North Carolina. He served as a colonial and state representative and official and was involved in the egulator Movement, the writing of the North Carolina Constitution, and the ratification of the federal Constitution. 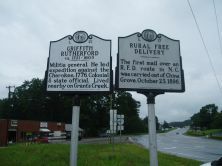 Rutherford lived in Rowan County outside present-day China Grove along Grant’s Creek. Born in Ireland in 1721, young Griffith Rutherford and his family emigrated to America in 1729. His parents soon died and relatives in New Jersey cared for him. In the early 1750s Rutherford became a surveyor for Lord Granville, moving to Rowan County in 1753. He settled along Grant’s Creek, and during the French and Indian War served as a captain in the local militia. Additionally, having served as both the sheriff of Rowan County, a land surveyor of the Granville District and Rowan County Justice of the Peace, Rutherford was a prominent target of the Regulator Movement. He led his forces into battle under Governor William Tryon at the Battle of Alamance in 1771. Despite having fought with Governor Tryon at Alamance, Rutherford became an early supporter of the American Revolution. Rutherford led his troops into South Carolina to help suppress the Tories of the Ninety-Six District. He was appointed brigadier general in April 1776, and quickly returned to Rowan County to begin amassing his troops for fighting on the western frontier of the state. In September 1776 Rutherford led a force of around 2,500 men into the frontier lands of North Carolina to suppress the perceived Cherokee Indian threat. His forces ruined the Cherokee settlements, decimating thirty-six houses and destroying most of the Cherokee’s winter food supplies. Between 1777 and 1780, Rutherford was active in state politics, serving as a representative from Rowan County. Additionally, Rutherford continued to attack the small Tory groups around Rowan County. In 1781, while reinforcing General Horatio Gates, Rutherford was injured and taken captive by British forces. He was held for ten months, before being freed in a prisoner exchange and returning to North Carolina in 1781. Soon after his return, he led his troops on the offensive in the Cape Fear region, hoping to stop the destruction of Major James Craig’s forces in Wilmington. Cornwallis’s surrender at Yorktown in October led Major Craig to abandon Wilmington, and Rutherford’s troops took control of the city for the Patriots. Throughout his life Rutherford amassed extensive property and wealth through land speculation, and eventually moved to Tennessee in the early 1790s where he was appointed as the first President of the new territory’s Legislative Council. He died in Sumner County, Tennessee, and counties were named in his honor in both North Carolina and Tennessee.